All transactions are safe and secure with a reliable history in online purchasing behind each of our associates. 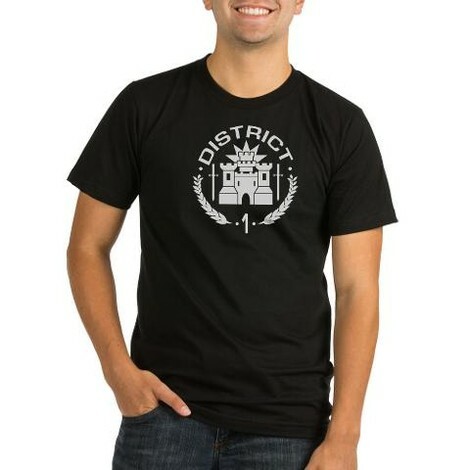 Buy the District 1 Luxury t-shirt to own Hunger Games clothing and merchandise. The design on the left represents District 1, Luxury. Citizens of the 1st District work to make luxury items for the Capitol. They often bear names that represent certain attributes of the items they make. For example, Marvel, Glimmer, Cashmere and Gloss are all tributes from District 1 who compete in the Games (Marvel and Glimmer in the first book and Cashmere and Gloss in Catching Fire). Get this Hunger Games District 1 t-shirt to show that you hail from where tributes volunteer to compete. In addition to the District 1 Luxury tee above, browse the Hunger Games Clothing Gallery for more apparel like men's and women's clothes, kids shirts or hoodies.